Q: According to Russian media reports, Russian President Vladimir Putin sent a congratulatory message for the 60th anniversary of the Russia-China Friendship Association. The message reads that the Association was there through almost the entire modern history of Russian-Chinese relations that have now reached the level of all-embracing trusting partnership and strategic cooperation. The good traditions of friendship, mutual understanding as well as good-neighbourliness that connect the two countries will be upheld and promoted in the future. How do you comment on that? What's your comment on the current China-Russia relationship? A: We have noted the relevant reports and highly commends President Putin's positive remarks on the Russia-China Friendship Association and the China-Russia relations. Yesterday, President Xi Jinping also sent a congratulatory message to the Russia-China Friendship Association, speaking highly of the important contributions of the Association to enhancing the mutual understanding and friendship between the two peoples. We hope the Association can, taking the opportunity of its 60th anniversary, open up a new prospect for the people-to-people exchanges between the two countries, make greater contributions to the people-to-people bonds and boost the development of the China-Russia comprehensive strategic partnership of coordination at a high level. The exchange of congratulatory messages between the two heads of state on the occasion of the 60th anniversary of the Russia-China Friendship Association has fully demonstrated the high importance they attached to China-Russia relations and their full approval of and expectation for the people-to-people exchange's role in developing bilateral relations. At present, the China-Russia comprehensive strategic partnership of coordination has been operating at a high level and at its best in history. The two heads of state have held meeting for four times this year and strategically led and promoted the deepening of mutual political trust between the two sides, advanced practical cooperation in various fields, exchanged views on major international and regional issues in a timely manner, maintained close communication and coordination in international and regional affairs and made important contributions to upholding world peace and stability. We stand ready to work with the Russian side to further encourage and promote people-to-people exchange between the two countries, consolidate the foundation of the long-standing China-Russia friendship and promote the China-Russia relationship at a high level for more outcomes. Q: First, as it marks the anniversary of the founding of the Workers' Party of the DPRK today, has the Chinese side sent a congratulatory message to the DPRK? Second, the Ambassador of the Republic of Korea has arrived in Beijing today. Does China have any expectation? A: With regard to your first question, October 10 marks the 72nd anniversary of the founding of the Workers' Party of the DPRK, and China has expressed its congratulation to the DPRK in accordance with our practice. 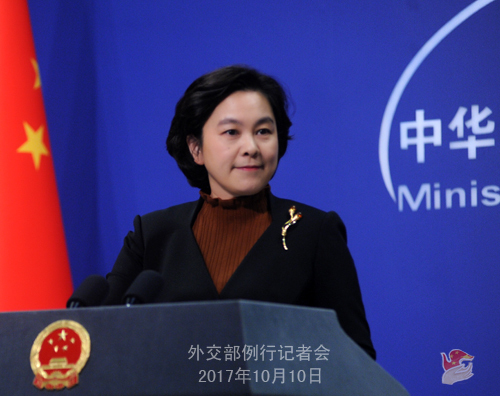 As to the second question, an envoy is a messenger of friendship and cooperation between the host country and the sending country. We hope all ambassadors can play a positive role in enhancing the mutual understanding and friendship between the two peoples and the sound development of relations between the two countries. We are looking forward to the positive role of the newly appointed ROK ambassador to China in promoting appropriate settlement of the existing problem in China-ROK relations, deepening the mutual understanding between the Chinese and ROK people and promoting the improvement of China-ROK relations. Q: According to reports, Bangladesh Foreign Minister AH Mahmood Ali recently told reporters that he held a friendly talk with Myanmar's Minister for the Office of the State Counsellor U Kyaw Tint Swe, and the Myanmar side has offered to receive the displaced people returning from Bangladesh. The two sides have agreed to set up a joint task force to coordinate the relevant issues. Bangladesh's Disaster Management and Relief Minister Mofazzal Hossain Chowdhury Maya said that with an increasing influx of the displaced people into Bangladesh, the country will allocate lands for camps to accommodate those displaced people in Bangladesh. How do you comment on that? A: The Chinese side has noted the direct communication with regard to this issue between Bangladesh and Myanmar recently, and appreciates the positive attitude of and the measures taken by the two sides. As a friendly neighbor of Bangladesh and Myanmar, China hopes that these two countries can maintain the current sound momentum of dialogue and negotiation and properly resolve the relevant differences. 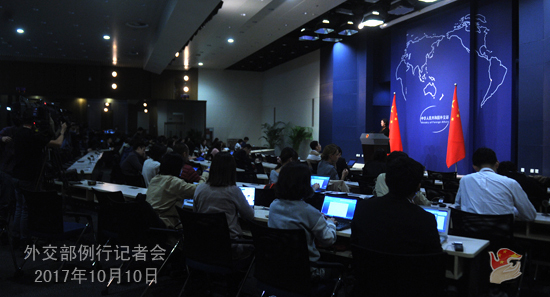 China is willing to continue playing a constructive role to this end. 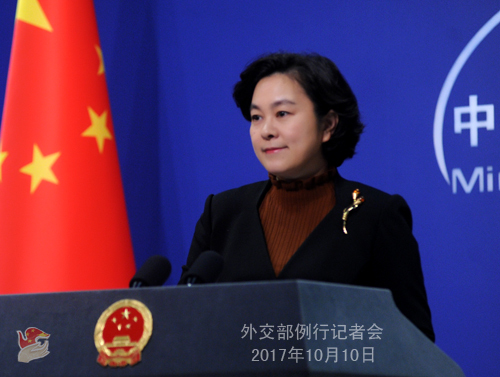 The Chinese side praises the enormous efforts of the Bangladesh government to shelter the displaced people. The Chinese side has provided emergency humanitarian aids to the Bangladesh government and will continue to offer assistance as its capacity allows. Q: According to reports, recently Director General of International Atomic Energy Agency (IAEA) Yukiya Amano said Iran has fulfilled its nuclear-related obligations under the Joint Comprehensive Plan of Action (JCPOA). High Representative of the European Union for Foreign Affairs and Security Policy Federica Mogherini said the IAEA has confirmed Iran's compliance with the JCPOA for at least 8 times, and it is obviously not the time to scrap the nuclear deal now. Russian Foreign Minister Sergey Lavrov said the JCPOA is one of the most important achievements of the international community that plays an important role in upholding the international non-proliferation regime and its full implementation should be continued. German Foreign Minister Sigmar Gabriel said Germany does not want to see this agreement damaged. What's China's comments? A: We have noted the relevant reports. The IAEA has certified Iran's fulfillment of its obligations under the JCPOA multiple times. As I said yesterday, The JCPOA is an important outcome of multilateralism and a model of peacefully resolving international hot-spot issue through political and diplomatic means, which has played a key role in upholding international non-proliferation regime and the peace and stability of the Middle East region and won widespread recognition and supports from the international community. We hope that all relevant parties can reinforce their political will and continue to uphold and implement the JCPOA, which serves the fundamental interests of various parties.